I took the elevator down to the hotel lobby around 9:30am. I had told people to meet me there if they wanted to join for my final run of a 442 day run streak. To my surprise, over 30 people in running shorts and sneakers were waiting by the door ready to go out for a 3-mile jog. It was my wedding day, and I wanted nothing more than to finish the run streak with family and friends who came to town for the wedding. This final run of the streak is one I’ll never forget. Just a few days after Mrs. RCR and I got engaged, we went to a yoga event hosted here in DC. The theme of the event was pilgrimage, or finding strength and discovery through a personal pilgrimage. With wedding planning, work, and countless other things, setting out on a long pilgrimage through the headwaters of the Ganges was out of the question, but it got me thinking about how I could go on a personal, daily pilgrimage to meditate and prepare myself for the major life changes to come. Naturally, running was the first thing to come to mind, and with recent talk of Matt’s run streak, starting one of my own seemed like the perfect option. I’d dedicate time every single day to go for a run. Rain or shine. Hot as all get-out or blistering cold. In sickness and in health. The only rule was that I had to run at least one mile, every day, until I got married. The number of days was arbitrary. I started June 17th, just about a week after we got engaged and planned to run until we sealed the deal. At that point we didn’t know when the wedding would take place, but I expected about a year. 365 days later, with nearly 80 more days to run, I realized it was going to be a bit longer than originally expected. But with each day that went by, I began to notice changes in myself, not just as I prepared mentally for the commitment, but also changes as a runner. Because I’m sure you’re already tired of reading the emo side of this streak, I’ll talk about what is important to you: running. 1) I can run anytime, even when I don’t want to. I used to think that after a long race I needed a day off. When I was really tired from work I needed to skip my workout. And when the bar was calling, it was a good enough excuse to leave the shoes in the closet. I can now confidently say that is not true. A short, light run after a long race actually feels great. Sure it might hurt, but the run will stretch you out and help facilitate recovery. And running when you’re tired is never as bad as you imagine. 10 minutes in and you’ll start moving like a champ. As for the bar excuse, well it still is a good one. But man up! Wake up early and go for a pre-work run. 2) Every run shouldn’t be taken so seriously. As much as I hate to admit it, a little over 442 days ago I was tracking every single run with my Garmin and trying to incorporate each run into a predetermine regimen. And it wasn’t always fun. Sometimes a run is just a run. That’s it. Each mile still counts even if it isn’t tracked. The health and mental benefits still come even if they don’t fit perfectly into your training schedule. We’re runners, yet often we forget the joy that comes from running for the sake of running. 3) Great fitness comes when I’m a happy runner. At one point during the streak I was probably at my peak running fitness of my life. I had raced 3 ultras in 3 months and was feeling great. Then came the burnout. I had several days of running for no other reason than to keep the streak alive. One day I would run just 2 miles, followed by 3 the next, and maybe just 1.5 the next. All junk miles. I was at top fitness when I was excited about the streak, excited about races, and loving running for the sake of running. Once that excitement flame started to fade, running every day was no longer making me a stronger runner. I’ve been a regular runner for roughly 6 years. By regular I mean someone who has at least a few key races on the calendar each year and averages at least a few runs a week. Yet for some reason, up until the streak, I never considered running a habit. It usually took a planned schedule, major goals, and external motivation to lace up the shoes and head out the door. As the streak went on, the daily run became increasingly natural. By simply knowing that I was going to do something every day, it took the pressure off making the decision of whether I would do it or not. If you are trying to create a running habit, Leo of Zen Habits, who knows way more about the science of habit formation than me, offers up great advice on forming habits that stick. Even with the streak over, the habit will stick. And that is something I’m proud of. Dedicate solo time each day to meditate on the marriage. I always knew that every run wouldn’t be life changing, and I was certain there would be plenty of days that 1 mile would be all I could muster. What I didn’t want to happen was to run only to keep the streak alive. With about 3 months to go, that is exactly what happened. For roughly 40 days during June and July I was hot, bored with the streak, and ready to take a break. I pushed through for the sole purpose of not disappointing myself and those who were tracking the streak. I admit to enjoying a run here and there, but for the most part I resented each mile. Then the breakthrough came. With just over a month left, everything changed. I was able to refocus on the original goal, returned to nostril breathing techniques I experimented with in the beginning, and started looking forward to (just about) every run. But I knew that feeling would soon go away again. When people asked why I didn’t just round it out to 500, the answer was simple: That wasn’t the goal. And the last thing I wanted to happen was to find myself 600 days into a streak I no longer believed in. 1) Set the goal small. Start with a minimum of just 10 minutes or maybe 1 mile a day. You can always run further, this is just a minimum. 2) Pick and end date. I would have quit long ago if I didn’t have the set end goal of the wedding day. If you want to run for 100 days, a year, 500 days, pick that goal and stick to it. 3) Skip the end date. Maybe rule #2 doesn’t work for you. Play around with a run streak for just a short period of time when you aren’t training. Test yourself and see how long you can go. Make it a game. I guarantee that once you get into the habit of running each day, it only gets easier. 4) Just run. I promise, unless you are incredibly injured or deathly ill, you can run at least a mile. Prove it to yourself by running even when you don’t want to, and chances are that single mile you set out on will turn into more. It took a lot of convincing, but if I can run the morning after staying up until 4:30 am during my bachelor party, I knew I could run anytime. Looking back, I had a lot of great runs. I also had a lot of terrible runs. Just for fun, here are some of the best and worst. Race days, like the Mt. 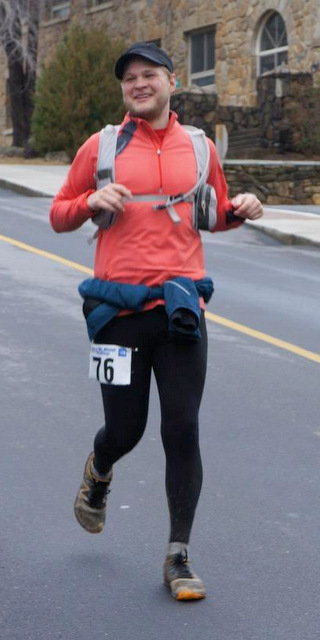 Mitchell Challenge 40-miler and the Bull Run 50 Miler. All three days of the 102 mile fast-packing adventure with friends. Vacation runs in Rhode Island, Vermont, North Carolina, and Maine. The first day, I was so excited. The last day in DC. I ran the same route as the first day of the streak and meditated back on all the joy and pain that came from this experience. The final run. I was so humbled by all the people who came out to share the experience with me and support Katie and me on our life together. The day after pretty much every race. 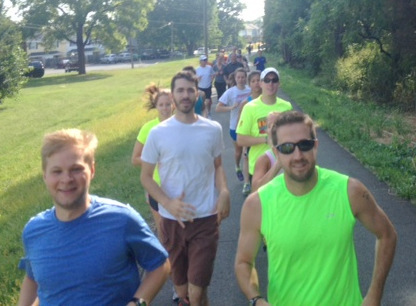 Sunday morning of my bachelor party…hard to remember that run. The days when I was sick and super tired. I hated only running the minimum mile. Nothing was gained mentally or physically during those runs.